Comprehensive Management Solutions, Inc. has 25+ years of experience overseeing law firm operations and running successful and profitable law firms. Our breadth of expertise includes managing everything from small “start-ups” to national law firms, while delivering a range of “C.O.O. to Go”™ services. Marcia Watson Wasserman, the founder and president of Comprehensive Management Solutions, Inc., is a nationally–recognized legal management professional who is known as a thought leader in the area of law practice management. She is also a Fellow in the College of Law Practice Management, one of an elite number of consultants who have earned this honor. 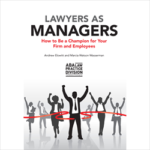 Marcia’s expertise covers a wide range of practice management areas, necessary to operating a successful law firm. These include: operational management reviews, management and leadership development and training, succession planning, strategic planning, retreat facilitation, cash flow projections and financial management reports, recruitment, compensation and benefits administration, development of employee handbooks and job descriptions, business formations, and relocations. Marcia founded the Managing Partners’ Roundtable discussion group in 2002, which is by invitation only to top attorneys, with a focus of elevating the legal management profession through the sharing of best practices. Since their inception, Marcia has led multiple Managing Partners’ Roundtables in cities in and around Los Angeles as more and more managing partners have asked to be included in this members-only group. Whether your law firm is experiencing issues that cannot be resolved in-house, or you are exploring ways to take your firm and its people to the next level, Comprehensive Management Solutions, Inc. can partner with you in creating a more successful and efficient law firm.